Note: this section only applies to breaches of the Code of Conduct. It does not apply to any Level 1 matter. (j) in the case of a commissioned police officer, recommend to the Minister that the appointment of the police officer be terminated or that the police officer be demoted or placed on probation for any specified period the Commissioner considers appropriate. Where there is a preliminary determination that a subject officer breached a provision of the Code of Conduct the outcomes may include one or more of section 43(3) actions (above). 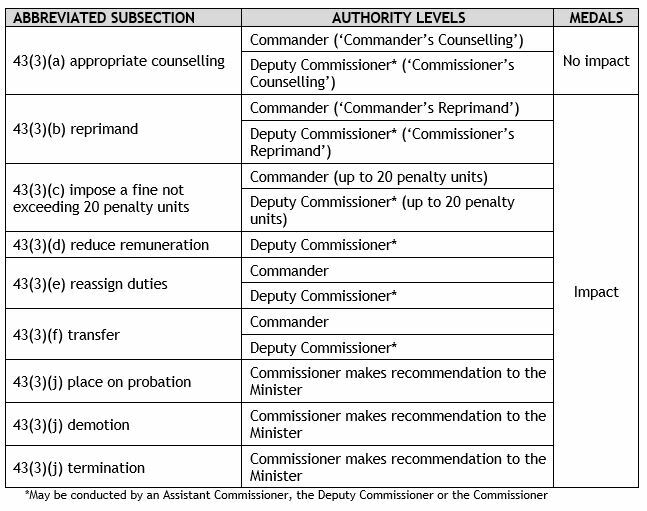 The following tables explain this section of legislation and shows which officers have delegated authority from the Commissioner to authorise certain actions. Should a subject officer disagree with a final determination, options are described under external review. 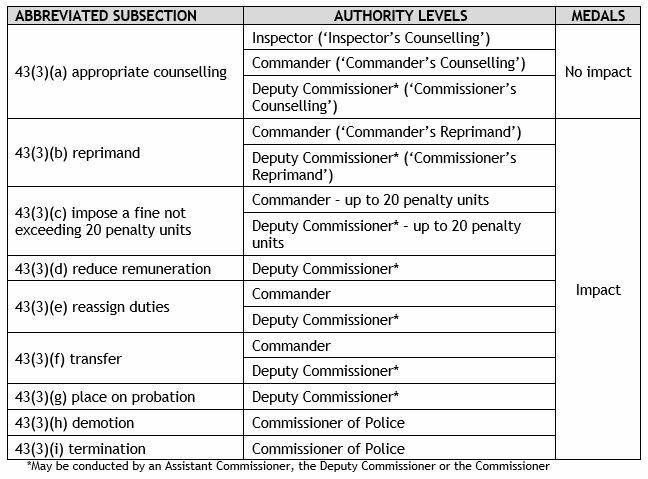 The various types of section 43(3) Actions are depicted in the two tables below (the first applies to members up to the rank of inspector; the second is for inspectors and above). There is a more comprehensive description of all of the section 43(3) Actions following the summary tables. This is the least severe formal action under the Police Service Act 2003. It constitutes formal, documented advice delivered in person by a senior officer to a subject officer. The advice is to include discussion of the issues and formal notification that the subject officer’s conduct has fallen short of expected standards. The subject officer is entitled to have an independent person present and will wear operational or office based uniform (without tunic). The key points must be documented including that the subject officer was informed of the consequences if they repeat the Code of Conduct breach in the future. The subject officer’s response must be documented in the ‘Member Comments’ section of the Determination Notice. Counselling may be delivered by an inspector, commander, or commissioner as considered appropriate; the higher the rank of the delivering officer, the more serious the counselling is deemed. If inquirers / investigators recommend provisional action including section 43(3)(a) counselling in the Provisional Report, they are to specify the rank of the delivering senior officer. This is then subject to endorsement by the authoriser. This constitutes the documented notification of severe disapproval delivered in person by a senior officer to the subject officer. The reprimand includes discussion of the issues and formal notification that the subject officer’s conduct is unacceptable. The subject officer is entitled to have an independent person present. They will wear the ceremonial uniform (tunic) and be paraded before the senior officer. The key points must be documented including that the subject officer was informed of the consequences if they repeat the Code of Conduct breach in the future. The subject officer’s response must be documented in the ‘Member Comments’ section of the Determination Notice. Reprimands may be delivered by a commander or a commissioner as considered appropriate; the higher the rank of the delivering officer, the more serious the reprimand is deemed. Reprimands delivered by commanders or commissioners must be witnessed by the subject officer’s manager. A reprimand will result in a limitation on the subject officer wearing or being awarded the Commissioner’s Medal or National Police Service Medal. If inquirers / investigators make recommendations that include reprimand, they are to specify the rank of the delivering senior officer and the period of limitation applicable to medals. This is then subject to endorsement by the authoriser (provided it falls within their delegation). A Commander is able to impose a limitation on the subject officer wearing or being awarded the Commissioner’s Medal or National Police Service Medal for a period up to and including 12 months. An Assistant Commissioner or the Deputy Commissioner can impose a limitation on the subject officer wearing or being awarded the Commissioner’s Medal or National Police Service Medal for a period up to and including 5 years. A fine can be imposed up to a maximum 20 penalty units. Fines are paid into the retained revenue account. The current value of a penalty unit can be found on the Department of Justice website here. This action will also result in a limitation on the subject officer wearing or being awarded the Commissioner’s Medal or National Police Service Medal. A Commander is able to impose a limitation on the subject officer wearing or being awarded the Commissioner’s Medal or National Police Service Medal for a period up to and including 12 months. An Assistant Commissioner or the Deputy Commissioner can impose a limitation on the subject officer wearing or being awarded the Commissioner’s Medal or National Police Service Medal for a period up to and including 5 years. A fine will be paid immediately unless otherwise agreed. Payment can be by salary deduction or other means. The subject officer will need to advise the authoriser which method of payment they wish to use. The subject officer’s response must be documented in the ‘Member Comments’ section of the Determination Notice. In exceptional circumstances, such as demonstrated financial hardship, consideration may be given to extending the maximum time period. The decision to approve a payment plan or financial hardship extension rests with the authoriser. This action will also result in a limitation on the subject officer wearing or being awarded the Commissioner’s Medal or National Police Service Medal. If payment is to be by salary deduction, the authoriser is to notify the Manager, Payroll Services, in writing of the fine and agreed payment plan. The Manager, Payroll Services is to facilitate the payment and calculate when the fine will be paid in full. The Manager, Payroll Services will notify the Professional Standards Commander in writing of the projected date of final payment. Should a subject officer resign or otherwise separate from Tasmania Police, any outstanding fine will be deducted from their lump sum leave payment upon termination of appointment. If no lump sum payment applies, action will be taken under the ‘failure to pay fine’ provisions below. Payment is also available by Electronic Funds Transfer (EFT), cash, credit card or cheque. These payments are made direct to Finance Services and can be in full or within an agreed payment plan. If payment is to be by other means, the authoriser is to notify the Manager, Finance Services in writing of the fine and, if applicable, the agreed payment plan. The Manager, Finance Services is to receive the payment and when the fine has been paid in full they are to notify the Professional Standards Commander in writing. (b) recover that amount as a debt due to the Police Service in a court of competent jurisdiction. The remuneration of a subject officer can be reduced within the range of remuneration applicable to them. A reduction in remuneration has an impact on the salary and a consequential impact on superannuation (both employee and employer contributions). Notification of the section 43(3)(d) Action occurs when the action is determined however, in the interests of fairness, it does not take effect until the next Annual Salary Increment Date. This is to ensure that the reduction applied is precisely the amount that is intended i.e. a reduced remuneration of one pay banding, rather than one and a half because the member is half-way through an Annual Salary Increment period. For members at the highest salary point within their rank, the reduction commences immediately. An Annual Salary Increment Date is the date upon which members are due to receive an increase in their salary point (refer Police Award). For Constables it is typically the anniversary of their graduation from Trainee to Probationary Constable. For other members it is typically the anniversary of their last increase in salary point due to qualification, promotion or completion of independent study. The authoriser is to notify the Manager, Payroll Services in writing of a decision to reduce a member’s remuneration. The Manager, Payroll Services is to facilitate the reduction and notify the Professional Standards Commander in writing of the date that the reduction will take effect. A reassignment of duties may include a subject officer being assigned non-operational duties or having their duties limited or restricted in some way. It can be for a specified period of time or indefinitely. The reassignment does not amount to a transfer. There may be an impact on the shift and penalty allowance or any other allowance – if that occurs it is considered to be an impact on remuneration. If, due to a reassignment of duties, the subject officer is required to use their private vehicle to travel to a different work location, the costs of private travel do not amount to impact on remuneration. The period of reassignment and the type(s) of allowance affected will be specified in the Determination Notice. A transfer from one position to another. Any type(s) of allowance affected will be specified in the Determination Notice. In the Abacus context ‘probation’ under section 43(3) means a period of time during which a subject officer who has breached a provision of the Code of Conduct is monitored for the purpose of assessing their conduct and performance for future fulfilment of the expectations of their appointment to Tasmania Police. It is different from ‘probation’ elsewhere appearing under the Police Service Act 2003 (e.g. on appointment or on promotion). If a subject officer is placed on probation under section 43(3)(g) the Determination Notice must state the period of probation and include CPD. For the period of probation the member’s line supervisor or manager will submit a quarterly Probation Report. The Probation Report will address set criteria including the member’s satisfactory completion of the CPD. The period of probation cannot be extended. If the member’s conduct and performance is not at the requisite level at the conclusion of the period of probation it may result in demotion or termination of appointment to Tasmania Police. Continuation or repetition of low standards of competency, integrity, performance or conduct will not be accepted. The reduction of a subject officer to any rank lower than the rank they currently hold. The only ranks are special constable, constable, sergeant, inspector, commander, assistant commissioner, Deputy Commissioner and Commissioner. The option of demotion is unavailable for special constables and constables (including first class constables, senior constables and senior constables (qualified) as these are titles and not ranks), although reduced remuneration may be a suitable alternative. If the subject officer holds a qualification for a higher rank and they are demoted to a lower rank, their qualification cannot be removed. A member holding the rank of sergeant is demoted to the rank of constable. After demotion they hold the title of senior constable (qualified). A member holding the rank of sergeant and the title of senior sergeant (qualified) is demoted to the rank of constable. After demotion they hold the title of senior constable (qualified). A member holding the rank of inspector is demoted to the rank of sergeant. After demotion they hold the title of senior sergeant (qualified). A demotion as a result of section 43(3) Action takes effect on service of a section 43(9) Notice. This means a termination of appointment as a result of action under section 43(3) and not as a result of the expiry of the instrument of appointment. It takes effect on service of a section 43(9) Notice. Termination may also occur under s31 of the Police Service Act 2003. In the case of subject officer who is a commissioned police officer the Commissioner makes a recommendation to the Minister that the appointment of the subject officer be terminated or that they be demoted or placed on probation for any specified period the Commissioner considers appropriate. Probation and demotion of commissioned officers will also result in a limitation on them wearing or being awarded the Commissioner’s Medal or National Police Service Medal. the loss of community confidence in the Police Service if the member were to continue as a police officer at their rank. The Commissioner must notify the member of the termination or demotion by notice served on the member. The Commissioner may withdraw the member’s medal. This page -- https://www.police.tas.gov.au/about-us/abacus/13-explanation-section-433-actions/ -- was last published on March 1, 2018 by the Department of Police, Fire and Emergency Management.